Before the digital computer made man, in completing a report on business people use typewriters. However, it has weaknesses, can not erase typing errors. Imagine that, since the typewriter was found 1714, by Henry Mill in England and Thomas Alva Edison developed into an electric typewriter, no one has thought to create a tool that can remove errors in typing. In 1951, complaints of the workers behind the counter, can be answered. 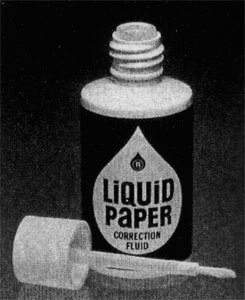 An American typist, Bette Nesmith Graham found a solution to cover up a mistake in typing with a liquid called liquid paper or that we are familiar with Tipp-Ex. 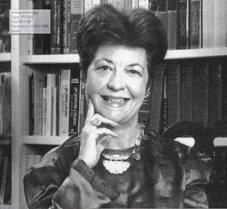 Bette Nesmith Graham was born March 23, 1924, at the corner of the city of Dallas, Texas, USA. He grew up in his hometown by his parents, Jesse and Christine McMurry. As usual education is very important in life, do not even like Bette education in school. In fact, he should be expelled from high school at age 17. However, very strong interest in working. Diligently, she applied to several companies who want to contain it to work as a secretary. His fate was lucky enough, her application was accepted at a company that needs people who are youthful and energetic. Then, by the support of the company he works, Bette Graham could continue their studies are pending. He then continued his intellectual career in secretarial school. Not long after, in 1943, she married young at age 19 years with Warren Nesmith, one American soldier who participated in World War II. This marriage did not last long, she divorced her husband. Under pressure and anxiety, Bette Graham have to feed one son. Good fortune landed on his life. He was appointed executive secretary at Texas Bank & Trust in Dallas. Jobs that require speed and accuracy make it often make mistakes in typing on an electric typewriter. This fault also happens to co-workers in the office. One day, Bette Graham saw painters who accumulate the color of an image with another cat. Later, he terinpirasi to create something that could cover up a mistake in typing the paper. Most of the literature says, Bette Graham dispensing liquid tempura paint paper with a customized blend with the color of paper and put in small bottles to be easily carried anywhere. The liquid is applied on top of the typewriter error. To apply paint potion, he uses a small brush. Before commercialized by its creators, the liquid is known as the Mistake Out. Bette Graham's work is simple enough to help in completing the work that piles up every day. This brilliant idea in great demand by office workers and secretaries. To make money on these findings, he began to study methods of promotion and marketing. Tirelessly, Bette continued to do research until the liquid is made more perfect proofreader. After several years of perfecting his findings, Bette Graham began to dare to offer a Mistake Out to the company at that time IBM dominated the office equipment business. However, this attempt failed. IBM refused on the grounds Mistake Out has no sale value. However, it did not weaken the spirit of Bette Graham. He later founded the Mistake Out Company business in her home. Not long standing business, Bette Graham get the ordeal. He was fired from his job because of an inexcusable mistake. This fate, he use to market their homemade products that. With a minimum investment, Bette Graham, promote and market the liquid cover typing errors. Even to increase the sale value, Bette Graham changed the name to Liquid Paper Mistake Out and still produce and sell products from the kitchen and the garage until the next 17 years. Order largest first occurred in 1962. A trader from San Antonio to order more products. In 1967, his company became a large and successful company supplying products to 31 countries. In fact, the company then named it Liquid Paper in 1976 was able to produce a net profit of more than 1.5 million U.S. dollars. In 1979, the Gillette Corp. buy the whole company Liquid Paper Bette and patents valued at 47.5 million and royalties on sales in each bottle. Bette Nesmith Graham died in 1980 at the age of 56 years. He was buried at his birthplace in Dallas, Texas. Although Liquid Paper was seldom used, but a simple work of Bette Graham still remembered to this day.